(Nanowerk News) The University of Colorado Boulder will play a key role in a NASA mission launching this week to study how space weather affects Earth’s two giant radiation belts known to be hazardous to satellites, astronauts and electronics systems on Earth. The Radiation Belt Storm Probes, or RBSP, mission will study the invisible, doughnut-shaped regions above Earth known as the Van Allen radiation belts that are filled with high- energy electrons and protons, some of which are darting at roughly the speed of light. CU-Boulder, which will receive more than $18 million from NASA over the mission lifetime, designed and built an instrument to capture and measure the high-energy, or “killer,” electrons and an intricate electronics package for another instrument suite to measure changes in the electric and magnetic fields in the belts. This artist's rendering shows the twin Radiation Belt Storm Probes as they will appear shortly after they have separated from their launch vehicle but before they have moved apart from each other and deployed their solar panels and booms. Set for launch on Aug. 24 from Cape Canaveral, Fla., aboard an Atlas V Rocket built by the Denver-headquartered United Launch Alliance, the RBSP mission includes twin, octagonal spacecraft shielded in aluminum that will be put into highly elliptical orbits -- roughly the same orbits of existing communication and weather satellites. The CU-Boulder instrument and electronic package were designed and built by faculty, professionals and students at the Laboratory for Atmospheric and Space Physics. CU-Boulder’s Relativistic Electron Proton Telescope, or REPT, was developed by a team headed by LASP Director Daniel Baker to measure the highest energy, potentially damaging electron populations in Earth’s radiation belts. Smaller than a shoebox, the instrument was designed to redirect such particles into a silicon detector that measures their individual electrical charges, Baker said. “Because the Van Allen radiation belts were the first discovery of the space age, the origin and fate of these relativistic, high-energy electrons is perhaps the longest standing puzzle in space research,” said Baker, also a professor in the physics department and the astrophysical and planetary sciences department. “Since these electrons, which are confined in Earth’s magnetic cocoon, are one of the principal risks for orbiting spacecraft, RBSP represents a major step in understanding and mitigating space weather issues.” Relativistic electrons travel at roughly the speed of light. Baker said the REPT team is focused on answering questions that have vexed space scientists for decades. “We want to know, for instance, precisely how these highly relativistic electrons are accelerated and lost from the remarkably efficient ‘cosmic accelerator’ that operates just a few thousand miles above our heads,” said Baker. Scientists believe most of the particles in the Van Allen belts were delivered by the solar wind that originates near the surface of the sun. The second LASP contribution to the mission is an electronics package known as the Digital Fields Board, which is the “brains” of the Electric Field and Waves Suite, or EFW, onboard the spacecraft, said Professor Robert Ergun, LASP team leader on the experiment. The LASP electronics package will provide data acquisition and signal processing for EFW, which includes two fixed antennas as well as four extendable wire booms, each roughly half as long as a football field. “Our Digital Fields Board is the heart and brains of the EFW, and it allows us to carefully select and compress data with maximum scientific return,” said Ergun, also a professor in the astrophysical and planetary sciences department. “CU-Boulder is widely regarded for its work in extremely advanced signal processing, and this low-mass, low-power electronics package packs a lot of punch.” Ergun said similar LASP instrument packages now are flying on five existing satellites and are slated to fly on an additional half-dozen satellite missions. While the two spacecraft spin like “giant hockey pucks,” the EFW’s four extendable wire booms will slowly unspool during the course of several days, said LASP Research Associate David Malaspina, a co-investigator on the LASP project. The antennas and booms will be used to measure the electric and magnetic fields in the radiation belts to better understand their relationship to the high-energy particles zipping throughout the region, he said. While the inner Van Allen radiation belt normally extends from about 1,000 to 8,000 miles above Earth, the outer belt reaches from about 12,000 miles to 25,000 miles high. The belts can more than double in size during extreme solar activity. Each 1,500-pound RBSP satellite is roughly 6 feet across and 3 feet high and will fly in nearly the same orbit, making identical measurements. Data from the mission will be used by dozens of other universities and federal agencies as well as commercial space companies that design and build communications satellites that pass through the potentially hazardous Van Allen radiation belts during orbit, Ergun said. LASP will receive roughly $6 million from NASA for the lifetime of EFW and roughly $12 million for REPT, both including data analysis, said LASP project manager Mary Bolton. The EFW experiment is led by the University of Minnesota. A miniature version of REPT known as REPTile designed and built by CU aerospace engineering sciences students is now slated for launch from Vandenberg Air Force Base in California, also on Aug. 23, as part of NASA’s educational CubeSat satellite effort. The student effort was led by Xinlin Li, a LASP researcher and faculty member in aerospace engineering sciences. Roughly a dozen graduate students have or will participate in the LASP experiments flying on RBSP, said Malaspina, who received his doctorate from CU-Boulder in 2010 while working on the project. More than a dozen other LASP personnel are participating in the RBSP mission, including Research Associate Scott Elkington, Systems Engineer Susan Batiste and Electrical Engineers Magnus Karlsson and Wesley Cole. LASP also is the only space institute in the world to have designed and built instruments that have been launched to every planet in the solar system. The RBSP mission is part of NASA’s Living with a Star Program managed by the Goddard Space Flight Center in Greenbelt, Md. 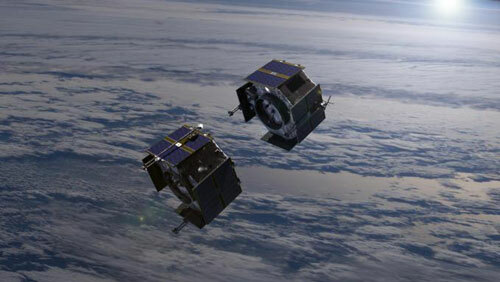 The Johns Hopkins University Applied Physics Laboratory built the RBSP satellites and will manage the mission for NASA. The Van Allen belts are named after former University of Iowa Professor James Van Allen, who discovered them in 1958 using data from NASA’s Explorer 1 and Explorer 3 missions.